Why Invest in a Self-Managed Investment (SMI)? Do you agree with these two statements? 1. Portfolio diversification is important to me as a means of reducing risk. 2. Another 2008 Financial Crisis can happen at any time. If the answer is yes to either then SMIs have been designed for you. Their aim is to give you exposure to returns and yet keep these returns independent of the financial system. This enables you to have genuine portfolio diversification because you hold assets whose value is not dependent on financial institutions or other underlying assets. It also means that if there is systemic collapse of the financial system, as long as the Internet is still working (it was designed to withstand a nuclear attack) then you still hold your SMIs. The Bitcoin Enhanced project is the first SMI to be rolled out. 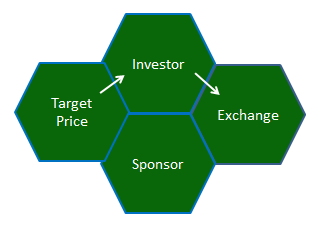 If successful it is likely to spawn imitators as the SMI structure gives hedge funds another way of offering their investment strategies with a different risk/return profile. Because they are unlikely to be classed as securities SMIs also open hedge fund strategies to the wider audience of non-accredited investors. But how do SMIs actually work? · People, and only people, have the ability to create monetary value. Even derivatives such as ETFs or futures contracts, have to be based on something that people give value to such as property, cash or gold. · People can maintain the value of something pegged at a given price. Really, that’s it. For examples of people doing these things check out some of my previous articles on the subject. Because these basic principles of finance are empowering SMI’s are part of a trend exemplified by Bitcoin for people to become more accountable and take more responsibility for their own finances. Owning an SMI token means consciously realising that what you own has value because you and other token holders believe in its value. Central banks have been piggy backing this human capability for years, often without the conscious realisation of people. It is only people’s acceptance of the value of a currency that enables the money making to process work. The operation of an SMI is as straight forward as its principles. 1. The Sponsor — this is the person or organisation that creates the blockchain tokens and publishes the Target Price at which the tokens are expected to trade at. 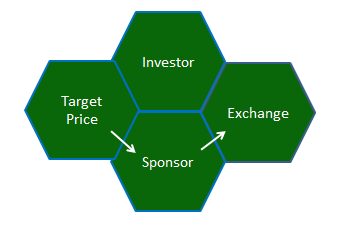 As the Sponsor earns the value of each token it sells it is in their interest to promote the SMI. 2. The Investor — that is you and others that want to participate in the SMI. 4. The Exchange — the trading platform where token holders and buy and sell tokens and where actual price discovery takes place. SMI’s are blockchain tokens. This enables ownership of tokens purchased to be recorded without the need for a third party. Bitcoin Enhanced has used the Waves blockchain to create its tokens but there are many options. People can buy their tokens from either the Sponsor or other token holders on the exchange. The Sponsor only sells its tokens at the Target Price. This option is one way the price of the tokens on the exchanged are kept pegged to this value. Selling your token is the way to exit your investment. Tokens can be sold to other people on the exchange. Like all markets, there may be times when there are not enough buyers on the exchange for this to happen (lack of liquidity). Supply of tokens increases when the Sponsor sells on the exchange. As the Sponsor only sells at the Target Price, the supply of tokens is driven by market demand. If the price has slumped because of low demand, the Sponsor will not be able to sell any of its tokens and the total supply of tokens does not increase. The main way the price of the tokens on the exchange is kept pegged to the Target Price is through the expectation and self-interest of token holders. There is no reason to own tokens except to trade them at the Target Price. Therefore it is in everyone’s interest that this takes place, even if this sometimes means waiting for there to be sufficient buyers on the exchange to sell your tokens. This combination of expectation and self-interest is likely to be the reason why gold kept a constant value for hundreds if not thousands of years — people needed a stable form of exchange and therefore they gave gold this stability. Investors are responsible for maintaining the value of tokens close to the Target Price on exchange. So as a new asset class SMI’s help avoid the systemic risks of the financial system while providing genuine portfolio diversification. 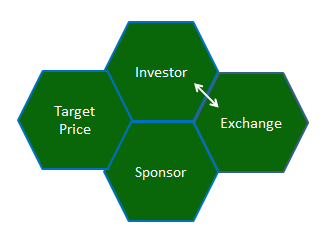 In the next article we will look at how the risk/return profile of SMIs differs from the traditional hedge fund model.